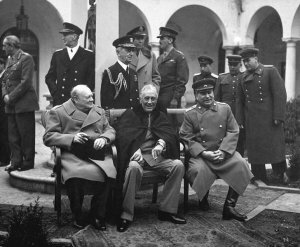 ARGONAUT was the eighth major Allied wartime diplomatic conference, held in Yalta on 4-11 February 1945. The conference was primarily concerned with the fate of postwar Europe and the future of the United Nations, but also included discussions of Russian intervention in the Far East. Stalin pledged to enter the war against Japan with 90 days of the end of hostilities in Europe. The Allied leaders also agreed to set in motion the process that eventually led to the war crimes trials in Nuremberg and Tokyo. By the time the conference convened, it was becoming clear to Churchill and Roosevelt that Stalin intended to seize control of most of eastern and central Europe. In particular, he had no intention of honoring his promise to permit free Polish elections. In the end, Stalin got most of what he wanted. This has sometimes been attributed to the very poor state of Roosevelt's health. Secretary of State Hull later said that "The President looked dreadful when he was wheeled into the room — sagging jaw, drooping shoulders. He appeared almost oblivious of his surroundings and of his guests. After several strong martinis, however, he seemed to come to life" (Roberts 2009). While Roosevelt's poor health could not have helped the negotiations, it was also true that the presence of powerful Red Army forces throughout eastern Europe meant that the Western Allies had few alternatives. Stalin was there and meant to stay, and there was little the Western Allies could do about it. Such concessions as Stalin made were either meaningless or ultimately in his own interests. In the Far East, Stalin pledged to support the Kuomintang rather than the Chinese Communists. This pledge was broken almost as soon as the Japanese surrendered, when the victorious Russians in Manchuria turned over large caches of captured arms and ammunition to the Chinese Communists.